Yasuda-san pursed his lips silently, as if to make sure his words would not change their minds and return to his mouth. Then he turned to the older man dressed in a baggy beige cardigan at the table next to him and gestured to his mid-section. The two friends appraised their respective narratives, taking turns like playing a game of catch. Although I had been conducting participant observation in this men’s caregiver support group for several months, and was aware that Yasuda-san’s mother and Takeda-san’s wife were both living with advanced dementia, this was the first time I realized that the men had also made the decision to give artificial hydration and nutrition to the ones they cared for. The ethical uncertainty of the decision lingered. 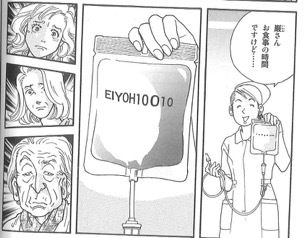 Yasuda-san was worried that perhaps he was not merely preserving her life, but extending it too long. These decisions about life-extending care could only be appreciated, as the two men agreed, case by case. Yasuda-san turned back to Takeda-san, who had been listening quietly. Yasuda: Your wife, can she still speak? Takeda: No, she hasn’t been able to speak for over a year. But I still visit. She still knows. I quickly learned that conversations like these would spring up constantly once people learned that I was interested in the subject of elder care. Some caregivers, like Yasuda-san, leapt at the chance to talk about their experiences, but often ended up circling around an unresolved sense of bewilderment, uncertain futures, ambivalent feelings, thoughtful, elliptical eddies. At times it seemed like the experience of care was as simple and as heart-breaking as the flash of a mother’s glance, silently looking up at her son from a hospital bed. At other times it was so complex that each caregiver’s circumstances, their family relationships, the nature of the illnesses involved, their religious background, or insurance status—all of it could potentially shift the fragile stability of the care situation. About three-quarters of older people in Japan with care needs are cared for primarily by family members, one-third of whom are men. Photo by author. Along the way, decisions had to be made. For Yasuda-san, the choice of having a feeding tube inserted into his mother’s stomach was not taken lightly; in making his decision he was making a choice to become a kind of “case,” to himself, as much as to me or to his friends. Becoming a case means becoming a possibility, different from but linked to a coterie of other possibilities. As an anthropologist, it is this sense of possibility that draws me toward each new case, but I had not considered that my interlocutors were also aware of themselves as cases. Indeed, becoming a case meant deflecting bioethical judgement, since each case was its own constellation of contingencies. Becoming a case motivates a further self-crafting of one’s first-person narrative (see Mattingly 2014). 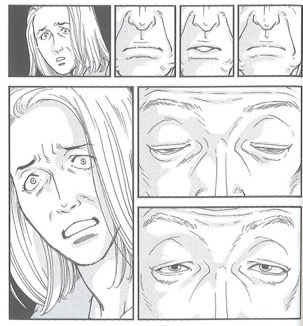 For Yasuda-san, this meant engaging with some heavy emotional and existential issues, such as weighing his mother’s destiny in this world and his responsibility for what he called her “soul” (tamashi), whose gaze he could not escape. Although a small percentage of those receiving a stomach tube are able to regain the ability to take in adequate nutrition by mouth (about 6.5.%), Yasuda-san was nearly certain that once the tube was in, it was never coming out. He could only wait until the stomach failed completely (maybe a matter of years) before his mother could die a natural death. Within this window of time, between the decision and the death, his case provided a point of conversation with other caregivers, like Takeda-san, whose story was similar, but also somewhat different, neither better, nor worse. Another case among many, neither tragedy nor comedy, Yasuda-san’s case gives flesh to the often polarized debate around end of life care and the boundaries of the “natural” or “good” death in the oldest and longest-lived country in the world. 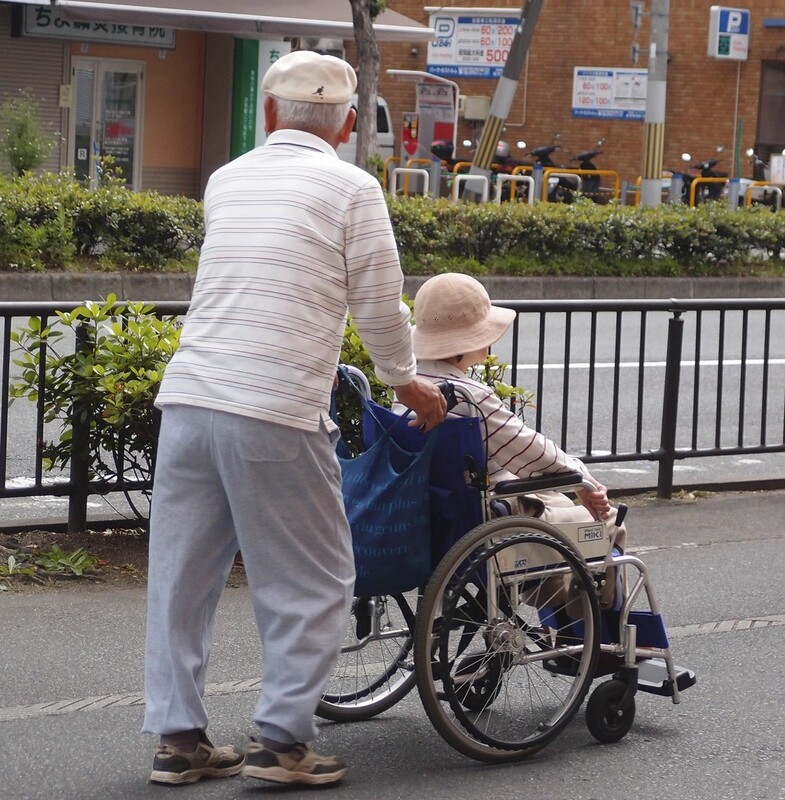 As of September 21, 2015 (national “Respect for the Aged Day” in Japan), 26.7% of Japan’s population were 65 or older. I had been following debates about the stomach tube already for a few months before Yasuda-san opened up to me at the support group. Nurses and care aides had at various times told me that the widespread use of stomach tubes among persons with dementia was an indication of staff shortage rather than an actual need or respect for the life and well-being of patients. “We are keeping [patients] alive to fit our own circumstances,” one nurse explained, “we would be in trouble if we let them just die, but it is just miserable.” Another care aide told me, “The family doesn’t visit but as long as the patient is alive and we are taking care of them, the family keeps on getting the pension, so of course they are going to get a tube.” He then asked if Americans were still using the tubes, since those used in Japan appeared to be American-made. The case, in my research, cannot help but be a case for the ordinary as a site of moral work (Das 2007; Mattingly 2014, 26). Michael Lambek has argued, “Ethnography supplies case material that speaks to the urgency and immediacy yet ordinariness of the ethical” (2010, 4). But this ordinariness is not to be seen in contrast with some abstract notion of the unusual or exceptional. As more and more stories surfaced, not only about tubes, but other forms of care and abuse as well, I began to hear fewer and fewer “exceptional” cases. I began to wonder, what might constitute the exceptional? Each case was different, to be sure, but at the same time, ordinary in the sense that it was grounded in the texture of everyday life. Yasuda-san and Takeda-san practiced care in ways that afforded them chances to reflect on themselves, their care, their roles as men, as sons, as husbands. They experimented with possible selves as their circumstances changed, as potentials of life emerged as one thing and then became another. Becoming a case meant that they could share in this process of mutual reflection and recognition without being identical. Instead, they embodied two possibilities of the ordinary, each following a logic of care when taken case by case. This publication was made possible through the support of the John Templeton Foundation, via The Enhancing Life Project. The opinions expressed in this publication are those of the author(s) and do not necessarily reflect the views of the John Templeton Foundation. Aita, Kaoruko, Miyako Takahashi, Hiroaki Miyata, Ichiro Kai, and Thomas E. Finucane. 2007. “Physicians’ Attitudes about Artificial Feeding in Older Patients with Severe Cognitive Impairment in Japan: A Qualitative Study.” BMC Geriatrics 7 (1): 22. doi:10.1186/1471-2318-7-22. Das, Veena. 2007. Life and Words: Violence and the Descent into the Ordinary. Berkeley: University of California Press. Lambek, Michael. 2010. Introduction. In Ordinary Ethics: Anthropology, Language, and Action, Michael Lambek, Ed. Pp.1-36. New York: Fordham University Press. Mattingly, Cheryl. 2014. Moral Laboratories: Family Peril and the Struggle for a Good Life. Berkeley: University of California Press. Nakanishi, M. and Hattori K. 2014. “Percutaneous Endoscopic Gastrostomy (PEG) tubes are placed in elderly adults in Japan with advanced dementia regardless of expectation of improvement of quality of life.” 2014. Journal of Nutrition, Health & Aging 18: 503-509. Jason Danely is Senior Lecturer of Anthropology and an affiliate of the Centre for Medical Humanities at Oxford Brookes University. He has been conducting fieldwork-based ethnographic research looking at aging, caring, grief, and ritual in Japan since 2005. He is the author of Aging and Loss: Mourning and Maturity in Contemporary Japan (2014 Rutgers Univ. Press) and co-editor of Transitions and Transformations: Cultural Perspectives on Aging and the Life Course (Berghahn 2013). Since 2011, he has served as Editor-in-Chief of the journal Anthropology & Aging. He is currently writing a comparative ethnography of family caregivers of older adults in Japan and the UK. Danely J. Case by case. Somatosphere. 2015. Available at: http://somatosphere.net/2015/case-by-case.html/. Accessed April 20, 2019. Danely, Jason. 2015. Case by case. Somatosphere. http://somatosphere.net/2015/case-by-case.html/ (accessed April 20, 2019).